Volume 26 of The Annals begins with essays that address the challenge of maintaining human connections in a biological century; Philip Katz focuses on the human encounter between therapist and patient whereas Vivian Rakoff emphasizes the continuing identity of the healer throughout history. Papers on adolescent development, which challenge readers to look beyond preconceived ideas, include Robert Galatzer-Levy's examination of adolescence as a social construction expressed in contradictory cultural narratives and Jack Drescher's exploration of the developmental narratives of gay men in order to illuminate the seeming invisibility of gay adolescents. A section dedicated to "Trauma, Violence, and Suicide" explores interventions with special groups of high-risk adolescents, including violent offendors, suicide attempters, and adolescent refugees. A special section on attention deficit/hyperactivity disorder and conduct disorders includes a debate on whether or not conduct disorder is actually a valid diagnosis. The final section of Volume 26 addresses social issues of continuing relevance to adolescent psychiatry: the juvenile death penalty and gays in the military. Reprinted here are the ASAP's position statements on these two issues along with its amici curiae brief in support of the petitioner in the landmark Supreme Court case of Thompson v. Oklahoma. 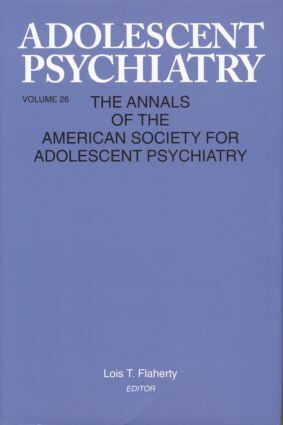 Volume 26 of The Annals tracks the continuing evolution of adolescent psychiatry as it strives to keep pace with therapeutic and social responsibilities which, in the 21st century, have become increasingly intertwined. We have here a typically thoughtful compendium that, in drawing attention to the pressing issues before those who work with adolescents, highlights bith the field's achievements to date and the work that lies before it. Part I: Schonfeld and Keynote Addresses. Katz, Lessons My Patients Taught Me. Rakoff, Perennial Medicine and Changing Technologies. Part II: Developmental Issues. Galatzer-Levy, Created in Others' Eyes. Drescher, Invisible Gay Adolescents: Developmental Narratives of Gay Men. Part III: Trauma, Violence, and Suicide. Rothe, Castillo-Matos, & Busquets, Posttraumatic Stress Symptoms in Cuban Adolescent Refugees During Camp Confinement. Thomas, Holzer III, & Wall, The Island Youth Programs: Community Interventions for Reducing Youth Violence and Delinquency. Ponton, A Risky Partnership: Working with the Adolescent Suicide Attempt. Katz, Gunasekara, & Miller, Dialectical Behavior Therapy for Inpatient and Outpatient Parasuicidal Adolescents. Part IV: ADHD and Conduct Disorders. Barnett, LaBellarte, Practical Assessment and Treatment of ADHD. Huffine, Conduct Disorder Should Be Eliminated from the DSM. Weissman, Conduct Disorder is a Useful Diagnosis for Adolescents. Flaherty, Editor's Comment: Is There Hope for Conduct Disorder? Part V: ASAP Position Papers. ASAP, ASAP Position Statement on Gays in the Military. ASAP, ASAP Position Statement on the Death Penalty for Minors. Flaherty, Summary of Thompson v. Oklahoma 487 U.S. 815 (1988). Ratner, Introduction to the Brief of the ASAP and the AOA as Amici Curiae in Support of Petitioner in Thompson v. Oklahoma. McLaughlin, Epstein, Weisburg, Freeling, Peabody, & Pincus, 1987 Amici Curiae Brief in the U.S. Supreme Court Case of Thompson v. Oklahoma.